- COMPATIBLE SYSTEM : Windows XP/7.0/8.0/8.1/10+WinCE+Mac+Linux, ideal use for businesses, shops, warehouse operations and other workplaces. - STRONG DECODE CAPABILITY : Auto identify UPC/EAN, UPC/EAN with Supplemental, UCC/EAN 128, Code 39, Code 39 Full ASCII, Trioptic Code 39, Code 128, Code 128 Full ASCII etc. 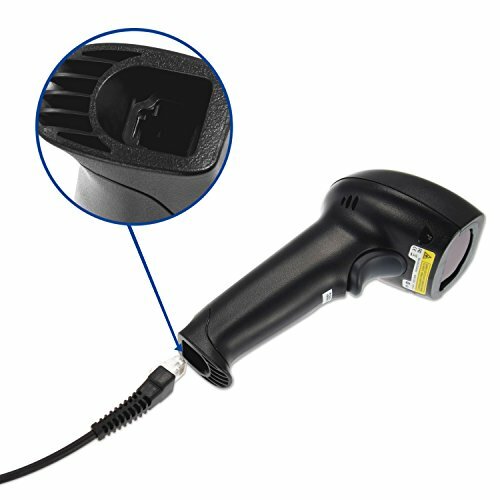 This Esky ES018 Handheld Barcode Scanner is a reliable easy to use which lets you accurately capture data for quick organization. Its ergonomic design, durable construction and easy customization makes it well suited for application in supermarkets, pharmacies, bakeries, book stores, magazine kiosks etc. Simply plug the scanner into your computer via supplied USB cable to immediately begin scanning!